Bird attracting; in harmony with the environment; different groups of plants for different soil types. 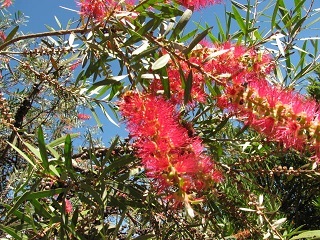 Australian Plants range from grasses, through shrubs, to trees. Many popular street trees are natives. Many native plants are especially popular to attract birds into gardens. Some are edible, especially Macadamia Nuts, Lily Pillies. Trees include Tuckeroo (Cupaniopsis anacardioides), Ivory Curl (Buckinghamia), Albery’s Red (NSW Christmas Bush, Ceratopetalum gummifera), Illawarra Flame Tree (Brachychiton acerifolius), Blueberry Ash (Elaeocarpus reticulatus), Norfolk Pine, Bunya Bunya, Macadamia, Davidson’s Plum.